Uriarte’s drawing practice is rooted in a mundane reality, based on small gestures that happen without artistic intention during office hours, for instance scribbling or drawing straight lines are examples of these gestures. He began his drawing practice in 2005, mostly by making monochromes, trying to fill out a sheet of paper as thoroughly as possible with the results of only one gesture. When he had explored all possible options in regard to monochromes (colour mixes, intensities etc.) he felt the need to move on to shape but wanted to use a formless shape, without any symbolic meaning. He therefore chose the amorphous - a roundish shape drawn without any effort that adapts to the space given by the sheet of paper, in the way that a balloon adapts to the air inside it. As Uriarte uses mostly paper from the DIN-family (A4, A3 etc. ), the shapes ended up being irregular ovals (proportional to the rectangular sheets of paper). Recently, he has specially started using simple arrangements of geometric shapes. These have been inspired by the Bauhaus and concrete painters/designers such as Anton Stankowski and Max Bill, who use extremely simple geometric shapes to create paintings, sculptures, logos, billboards, furniture and clocks. Uriarte is attracted to the idea that art can be completely abstract and functional simultaneously. The ambivalence between the clarity of a pictogram in signage, or in a corporate brochure, and the existence of the same pictogram as the only element of an abstract, minimal painting with open interpretation fascinates him, and he finds a relation between this ambiguity and his own work, which is also deeply rooted in reality and at the same time very abstract and minimal. For his exhibition at i8, he leaves colours aside and limits himself to black on white. This decision emphasizes the sculptural and rhythmical qualities of the shapes in the drawings. Space becomes almost the only protagonist and is structured by geometric elements: squares, rectangles, triangles and circles, arranged in superpositions, sequences, subdivisions and reflections. Often the elements in each drawing transform into other elements, for example circles turn into a square or squares turn into a circle. It is an almost alchemic transformation. Some of the geometric figures may remind us of cultic symbols (e.g. a triangle for the Holy Trinity), but almost always they are structured by mathematical rules and formulas. Additionally, each drawing contains gradings from pitch black to light, so even though the drawings are theoretically abstract, there is an illusion of light and shadow that creates an atmospheric, almost mystic energy. On the other hand, there is a certain playfulness that reminds us of educational systems with a very optimistic world view, such as Bauhaus, Montessori or Waldorf, in which geometric symbols were used as tools to simplify and better our understanding of the world, and to further individual imagination and fantasy. The exhibition as a whole could be read as a collection of signs that, depending on the viewer’s background, can be interpreted as mathematical formulas, architectural projects, musical compositions or poems on the wall. The black & white gradings and similar sizes, as well as the methods of composition, turn the works into a suite with strong formal ties that have a dynamic flow of energy between them. The main theme could be understood as construction through division, repetition, reflection or echo. Ignacio Uriarte (b. 1972 in Krefeld, Germany) lives and works in Berlin. He studied audiovisual arts at the Centro de Artes Audiovisuales in Guadalajara, Mexico from 1999 to 2001. 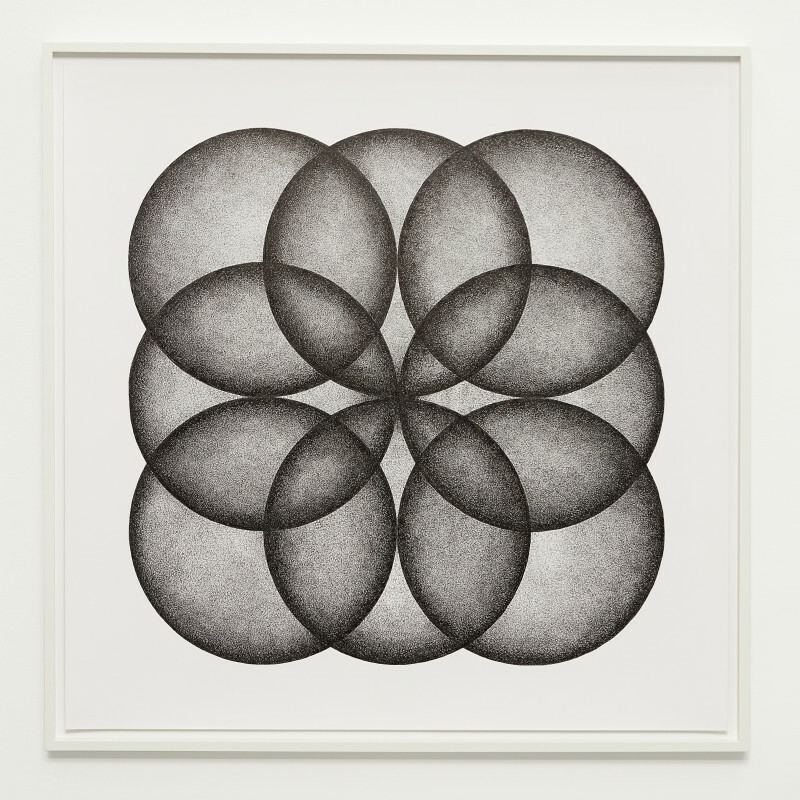 Uriarte’s solo exhibitions include Apropos Papier: Ignacio Uriarte, Bürokünstler, Leopold Hoesch Museum, Düren (2018); Bürozeit, Kunstmuseum Villa Zanders, Bergisch Gladbach (2015); Unos y Ceros, MARCO, Vigo (2014); Acht Studenten zählen, Berlinische Galerie, Berlin (2014); Binaries, UMOCA (Utah Museum of Contemporary Art), Salt Lake City; Line of Work, The Drawing Center, New York City; Productive Inefficiency, Skuc gallery, Ljubljana (all 2013); Workspace, DAZ (Deutches Architektur Zentrum), Berlin (2012); Works, Sala Rekalde, Bilbao (2011); The invention of letters, PICA Perth Institute of Contemporary Arts, Perth (2010) and Tan sencillo como una línea ó un círculo, Laboratorio 987, MUSAC, Leon (2008).